Motherwell winger Chris Humphrey would jump at the chance to play for Scotland after learning he qualifies through his Kilmarnock-born mother. 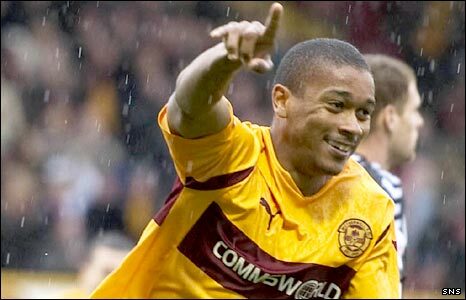 Jamaican-born Humphrey, 23, has been key to Motherwell's run of league form that has raised hopes of qualifying for Europe for a fourth successive year. The Lanarkshire side sit third in the Scottish Premier League, eight points behind Celtic and Rangers. "I would welcome a chance to be part of Craig Levein's plans," said Humphrey. Humphrey has secured a regular place in the Motherwell starting line-up under the guidance of former Scotland manager Craig Brown. He scored in the Fir Park outfit's recent 3-1 home win against St Mirren and provided two assists in Motherwell's 2-0 victory away to Hearts at Tynecastle. A product of the West Bromwich Albion youth system, Humphrey was born in Jamaica but moved to England as a child and began his career with Walsall's Centre of Excellence aged just five. He was signed by former Shrewsbury manager Gary Peters when he was spotted playing for West Brom's reserve team in 2006. "My mother left Scotland when she was six or seven years old to stay in England," Humphrey told the Motherwell website. "She then moved to Jamaica when she was 16. "I would love to play international football but I know it is dependent on me performing to the best of my ability. "My priority is just to keep improving and see where that will take me." Humphrey spent most of last season at Motherwell on the bench, mainly due to the form of Jim O'Brien, now with Barnsley.